The Biotin Labeling Kit of Elabscience offering a collection of reagents required for biotin labeling, is designed to label antibody with amidogen(NH2-). The biotin in the kit is sufficient and has been activated for direct use. And the reagents are enough for approximately 3 labeling reactions each containing 0.2-2mg of antibody or other protein. Each kit includes 6 Filtration tubes for desaltination of antibody labeling without the need for dialysis . The whole procedure is simple and can be completed in 90min in proficient operation. 1. All-inclusive: The kit provides all the reagents required for biotin labeling. 2. Quick: The whole procedure takes only 90min. 3. Convenient: Desaltination can be achieved by Filtration tube, sparing the need for dialysis or gel filtration. 4. Flexible: The procedure can be easily adapted to both smaller and larger scales, with 0.2-2mg of protein labeled each time. 5. Perfect results: The kit has been optimized to determine the optimum labeling ratio of biotin to antibody, lowering the possibility of protein inactivation resulted from excess biotin labeling. The NH2-Reactive Biotin reacts with the primary amine (N-terminal and the side chain of lysine residue) specifically, forming stable amide bond. The volume of NH-Reactive Biotin used in every reaction depends on the amount and concentration of the protein to be labeled. By optimization, we determine that it’s optimum when the molar ratio of the Biotin to protein is 20:1 in labeling 2mg/mL of protein sample(IgG,150KD). Example: About 13.3uL of 10mM NH2-Reactive Biotin solution is to be added for 0.5 mL of 2mg/mL IgG(150,000 MW) solution. 2.Calculate the volume of NH2-Reactive Biotin to be added. 3.Bring the kit to room temperature 20min before experiment (Note: put unused NH2- Reactive Biotin back to the refrigerator). 4.Dissolve NH2- Reactive Biotin: add 30uL DMF to the vial of NH2- Reactive Biotin, let it stand for 10min until it dissolved fully. The concentration of biotin is 10mM now. 2.Add 13.3uL NH2-Reactive Biotin and appropriate Labeling Buffer to the Filtration tube, making the final concentration of the protein solution at 2mg/mL.Pipette to mix it thoroughly and incubate the tube for 30min at 37°C. 3.Centrifuge at 12,000 x g for 10min. 4.Add appropriate Labeling Buffer to the Filtration tube until reaching 0.5mL. Pipette to mix it thoroughly and centrifuge at 12,000 x g for 10min. Repeat this step onceagain. 5.Add 0.2mL Labeling Buffer to the Filtration tube and pipette to mix it thoroughly. Invert the filtration tube and put it into another centrifugal tube. Centrifuge at 6,000× g for 10min. 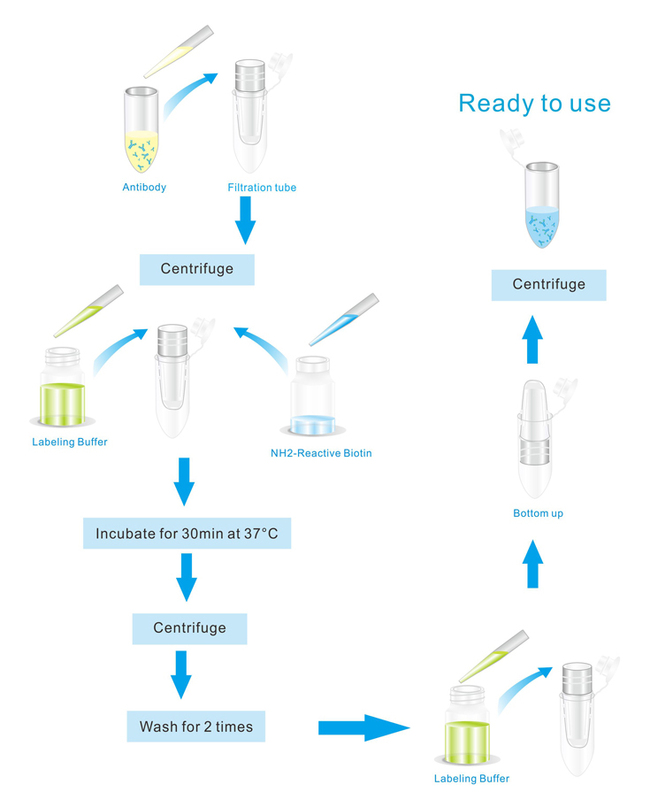 6.Collect the solution in the centrifugal tube, namely antibody labeled by Biotin. 1.This kit can be also used to label antigen,HRP and polypeptides with amidogen (NH2-). The labeling ratio depends on theamount of amidogen. 2.DMFshould be preserved airtight in a dry place. Seal it with the parafilm immediately after use. 3.In the procedure 5 above, Labeling Buffer is used to collect the labeled protein.You can also use other buffer or protective agents as you like. 4.The kit is stable for 1 year before opening. Please use it before its expiration date. 5.The Filtration tube provided in the kit has a molecular weight cutoff(MWCO) of 10KD. So please be careful of the molecular weight of the antigen or polypeptide to be labeled. 6.In the step 2 above, for other quality antibodies, we should control the final concentration of antibody is 2 mg/ml strictly, then calculate the volume of NH2- Reactive Biotin required according to the quantity of the antibodies.